Here's the formal answer. See below for the informal stuff! Fred Bortz is one of the nation's leading writers of science and technology for young people. In his books, articles, and personal appearances, he shares with his audience the joy of discovery that fueled his previous twenty-five year career in teaching and research in physics, engineering, and science education. From 1979 through 1994, he was involved in research at Carnegie Mellon University, from which he earned his doctorate in Physics in 1971. Reviewers have commended Fred's books for their clarity, energy, and high interest level. Few children's writers have achieved his combination of subject-matter expertise, story-telling skills, and enthusiasm for knowledge. Speaking of reviewers, Fred has become a pretty good one if he does say so himself. His byline has appeared on the book review pages of the Philadelpia Inquirer, the Dallas Morning News, the Cleveland Plain Dealer, the Seattle Times, the Pittsburgh Post-Gazette, and other major newspapers, giving insights into books on science and technology -- and occasionally on other topics -- for adults who are fascinated by the latest developments and love a good book. Fred is also known as an excellent teacher. He was an instructor for the Institute of Children's Literature's correspondence courses for ten years, and taught a workshop in writing about nature, science, and technology as part of master's degree program at Chatham College, and has now offered science courses in the Osher Lifelong Learning Institute of the University of Pittsburgh. His students have been published in a number of children's magazines, and at least two have published books. How many books has Dr. Fred written and what are his most recent ones? Dr. Fred's twentienth book, Meltdown: The Nuclear Disaster in Japan and Our Energy Future appeared in 2011 with a 2012 copyright. It is his fourth book in four years from Lerner Publishing Group. 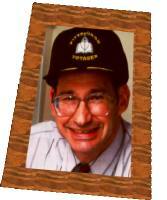 Why is Dr. Fred wearing a cap? Is he bald? That's not just a cap; that's a Pittsburgh Voyager cap! Dr. Fred is proud of his association with Pittsburgh Voyager, a non-profit corporation (now known as RiverQuest) that has transformed U.S. Navy training vessels into floating science classrooms on the three rivers of Pittsburgh, Pennsylvania. Dr. Fred was an active member of Voyager's Board of Directors from just after its founding in 1993 through 1999. To answer the hair question, you'll have to find another picture, see the next question, or invite him to visit! Why does Dr. Fred wear bowties, and does he tie them himself? Dr. Fred wore regular ties until he opened this website. Then the people who designed the Dr. Fred logo at the top left corner of this page included a bowtie. Next the artist who drew the caricatures of Dr. Fred for Dr. Fred's Weather Watch: Create and Run Your Own Weather Station gave him a bowtie, too. He decided that a bowtie would be fun, especially if he could tie it himself, like the one in the picture here. Now Dr. Fred is always looking for new and bigger tie-it-yourself bowties with lively designs. If you want to get him a present when he visits your school, a Young Author's Day T-shirt is fine, but directions to a store that sells special bowties is even better! What are some of Dr. Fred's other books? Techno-Matter: The Materials Behind the Marvels, the winner of the prestigious 2002 American Institute of Physics Science Writing Award for works aimed at young readers. Techno-Matter was also named to two prestigious lists, the LA 100 and the New York Public Library Books for the Teen Age and was designated best grade 7-12 science book of the year by the Society of School librarians International. Among his early books, the best known is Catastrophe! Great Engineering Failure--and Success, which was a Selector's Choice on the National Science Teachers Association list of Outstanding Science Trade Books for Children for 1996. For a full list of Dr. Fred's books, visit the Books by Dr. Fred page. 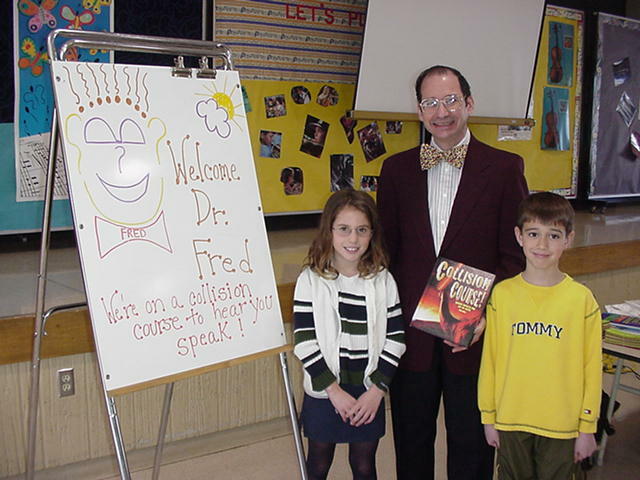 Does Dr. Fred visit schools?